OXFORD, Miss. — Ole Miss women’s basketball opened the month of December with a tough 60-49 loss to Jacksonville State at home in The Pavilion. It was apparent from Coach Yolett McPhee-McCuin’s opening statement in her postgame press conference she was not pleased with the Rebels’ performance. “If I could write a letter of apology to every fan that was out there today, I would, because I thought that our level of energy and fight was not one that is reflective of what I want to be represented here at Ole Miss,” she said. “I’m definitely going to figure out a way to get our players to give more execution and effort for 40 minutes. Jacksonville State came in and just manhandled us for 40 minutes,” Coach Yo added. The Gamecocks (4-3), who typically shoot just under 30 percent from long range, were held to a 23% clip against the Rebels Sunday. With Coach Yo’s emphasis on aggressive defense, Ole Miss ranks near the top of the SEC when it comes to defending the three-pointer. However, Jacksonville State out-rebounded the Rebels, especially on the offensive glass, where the Gamecocks held a 19-11 advantage over Ole Miss. The visitors finished with a total rebounding edge, 46-43. 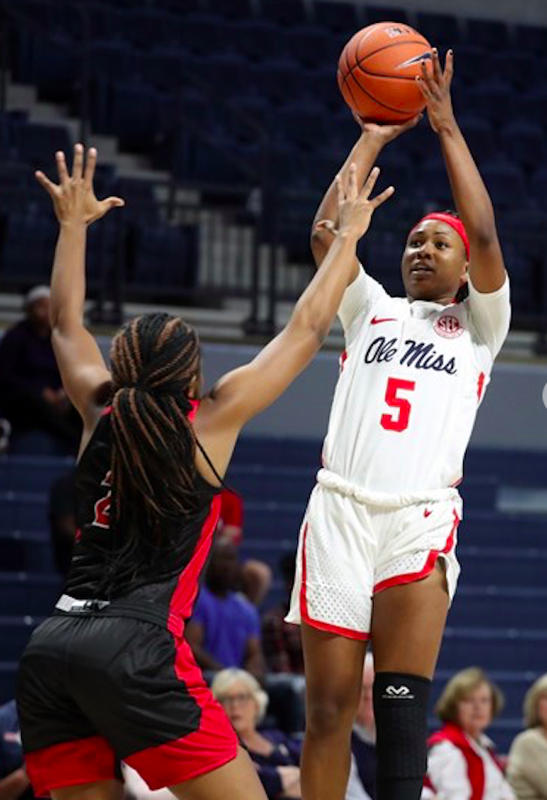 Crystal Allen led the Rebels with 19 points, while Shandricka Sessom added 14. Jhileiya Dunlap led the Rebels on the boards, bringing down 8 in the contest. Another continued point of emphasis for the Rebels going forward is ball security. Ole Miss turned the ball over a season-high 20 times Sunday, and the Gamecocks were able to take full advantage and score 24-points off of those turnovers. 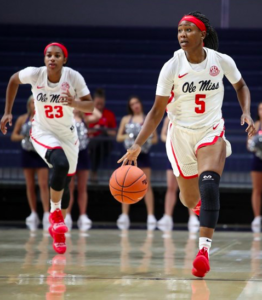 The Rebels were without starting point guard Mimi Reid who suffered a concussion before the TCU game. After the game, Coach Yo talked about her absence. The contest was tight throughout the first half, and the Rebels went to intermission with a three-point lead, 28-25, courtesy of a last-second three from senior Crystal Allen. 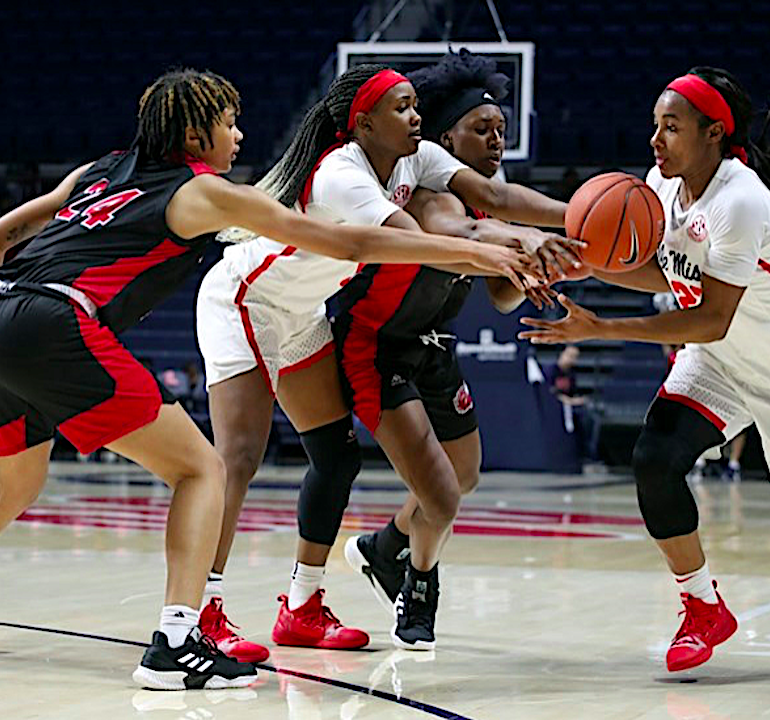 In the second half, however, Jacksonville State slowly pulled away from Ole Miss in the third quarter as the Gamecocks had a higher shooting percentage and greater rebounding than in the first half. Jacksonville State finished the game shooting 4 of 5, en route to a 60-49 victory. “We have to get mentally tougher,” Coach Yo noted. Even in the loss, Crystal Allen was able to notch 19 points along with 3 assists. Both her points and assists were over her season average. Allen currently has 977 career points, just 23 short of making her the 30th Rebel to ever pass 1,000. Ole Miss (3-6), will return to the court on December 8th to face Savannah State. The Lady Tigers (2-4) have lost their last four contests. Savannah State opened their season with a 155-26 win over Wesleyan College, so it is clear they can score. Tipoff will take place at 2:00 p.m., and the game will be televised on the SEC Network +.